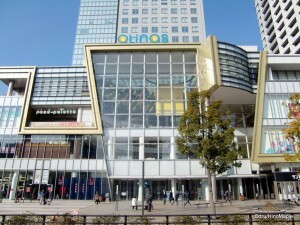 Kinshicho is the last major centre in Tokyo before you are in the suburbs, or heading towards Chiba. It is located just a few minutes outside of Akihabara and one station away from Ryogoku. The area itself is not very interesting for most travellers, but for those of you who use the Narita Express to enter or leave Tokyo, you will pass through Kinshicho. When leaving Tokyo, just after you exit the tunnel, you will be in Kinshicho. The area has a storied past and a growing future. As any other part of Tokyo, Kinshicho is constantly changing and evolving. What it will be like in 10 years is anyone’s guess, but the chances are that it will get much better. The first thing to do in Kinshicho is to decide whether you want to go north or south. Depending on what you want to see or do, each side will have its own purpose. The south is considered the seedier side of Kinshicho. In the south, you have two infamous things to do. The first, less seedy, is the JRA (Japan Racing Association) building. It is the easiest location to access in the east for horse race betting. It’s not uncommon to see hundreds of men around the JRA building on a Friday evening, or even on Saturday and Sunday. Horse race betting is still huge in Japan but not too many people talk about it. It’s very common to see older men hanging out in front of the building just looking at the current horse races and deciding who to bet on. I have never been inside the actual building but the betting process itself is pretty simple. All you really have to do is go up to a computer terminal, select the horse you want to win and so on and that’s that. Insert your money and you are done. I’m not sure if there are English instructions as I’m not interested in the horse races but if you do walk around the outside, you can watch some of the races from a TV screen located in one of the lounges. Note that you will find JRA buildings all over Tokyo and Japan but these are rarely where the races are held. They are just betting offices with TVs set up for people to satisfy their gambling habits. Racing happens near Shinagawa and out west from Tokyo. 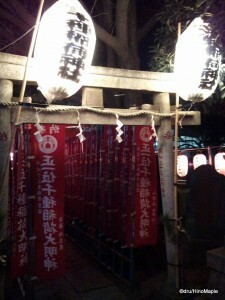 Shrine behind the JRA building. The other seedy part to Kinshicho has to be the hostess clubs in the south. Behind the JRA building will be several dozen clubs and bars. Most of these are the cheaper cousins of their expensive Ginza and Kabukicho counterparts. It’s still somewhat seedy during the day and the fact that there are several tall buildings obscuring the actual area makes it interesting. Once you walk behind the JRA building at night, you’ll suddenly come upon several buildings with various lights flashing and men trying to push you into their clubs so that you can spend several tens of thousands of yen. Nearby you can also find several love hotels that are more functional than fun. Walking around in the area late at night may not be safe for everyone and it definitely isn’t as safe as Kabukicho. There is a reason many people call Kinshicho the Kabukicho of the east and I would tend to agree for just this area alone. The bad thing is that people tend to associate Kinshicho with these clubs and only these clubs these days. When I talked about the storied past of Kinshicho, I was talking about these clubs in the south, but I was also referencing the fact that Kinshicho, botn north and south, was once a central area for the Yakuza, Japanese organized crime. These days they are limited more to the southern areas. While the south may sound like a bad area to visit, due to its reputation, the shops tend to be a lot cheaper. You have a greater tendancy to find good cheap restaurants to eat in, cheap goods, and shopping tends to be more Japanese in flavour. 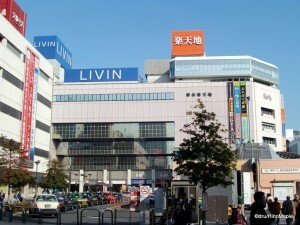 There is a small department store, small for Tokyo standards, and a small Yodobashi Camera. Kinshicho has the usual set of small ramen and donburi shops as well as one of several Wallmart shops in Tokyo. While they go under the name Seiyu, or as most people in Kinshicho say, Livin. The company known as Seiyu is actually a wholely owned subsidiary of Wallmart. It can be great as they offer the most competitive prices for their items and they also sell Wallmart goods. It’s great to find really cheap food products when shopping there, but that isn’t always the case. When shopping it is always true that if you visit one shop, they specialize in one type of food while another specializes in others. It never hurts to shop around but it does take a lot more time to get things done. The north side of Kinshicho has undergone a dramatic change over the last 5-10 years, or so I’ve been told. In the past it was a Yakuza neighbourhood. There would be several yakuza living in the area and the area was fairly “dangerous” to live in. While I think it could be dangerous, as long as you keep to yourself in any such area, you should be okay. In Japan, I don’t believe the organized crime is actually going to start shooting people randomly or have a gang war, but those were possibilities. Today, things are very different. The entire area has undergone some revitalization and a type of gentrification. Many of the local businesses have put up signs saying that the Yakuza are no longer welcome in their shops and to leave the area. Many of them seem to have relocated more towards the south and east and many of them have “left” their organizations. In fact, as of the writing of this post, the police are cracking down on organized crime for various reasons which allow many areas to be revitalized. The north area of Kinshicho is one of them. One of the first major turning points in the north’s revitalization has to be the Olinas mall. 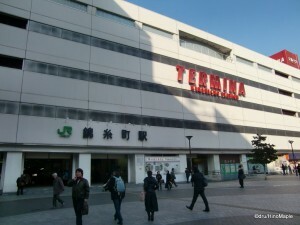 It is a larger western style shopping mall with lots of underground parking and various shops inside. There is a theatre as well as a small food court as well. The layout is a bit confusing to get around but it’s a nice place to do a bit of shopping, but for those looking for a Japanese style of life, this is not the place to go. It is your typical western shopping mall teeming with teenagers. 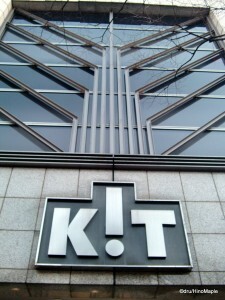 One of the focal points of Kinshicho has to be Kinshi Park. It’s a medium sized park for Tokyo that is currently undergoing renovations. Renovations should be completed by the end of 2011, but this is just my own personal guess. In the north east corner is the Sumida City Gymnasium. It is a public community centre of sorts where you can do all kinds of sports. You can play basketball, badminton, table tennis, go swimming, participate in aerobics, or even use a weight room. The gym was completed in March 2010 and still looks very new. The facilities are very cheap but you do need to share with the others who use it. Next to the gym on the west side is a set of tennis courts. If you have never practiced playing tennis in Tokyo, you will be in for a bit of a surprise. They utilize a type of artificial turf and rubber pebbles to simulate grass. Unlike typical artificial turf, this type seems to have a little flexibility and might be easier on your joints, but I haven’t personally tried it so I can’t comment too much on it. It is still very popular and getting a chance to use it is still difficult. In the south east corner of the park they are erecting a dual baseball field. Basically it will be two baseball diamonds back to back that is designed for practice rather than real competition. For real competition, I believe they will utilize just none of the diamonds at a time. It’s an interesting design and it will be finished in early 2011. As for the rest of the park, most of it is just open space with a bit of greenery. I’m not sure how much will stay the same but the large open area is popular for young students to play in and for people to just relax on a nice spring afternoon. 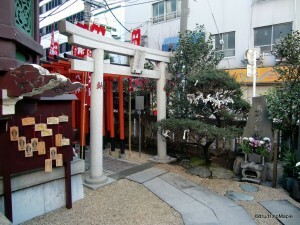 If you need a little spiritual help, there is a small shrine located on the south west corner that provides a very unique look at Japan. Aside from the park and Olinas, the other main anchor of the north has to be the Arcakit building and the Termina complex that surrounds the station. The Arcakit main building has several floors of shopping including a large Daiso. There are lots of things to see and do inside and it can be treated as its own shopping mall. Be aware that there will be lots of families there as there is a famous baby shop where you can buy bulk items and almost anything you can imagine a child would want. If you fancy a nice meal, I’d recommend the top floor of the building as the north facing shops have wonderful views of Tokyo Sky Tree which is nearly completed. If the station area is not of much interest to you, you can always head just a little north into the small side streets. This area has various little shops and restaurants of varying quality. Some restaurants are very delicious and others are not so. It can be hit or miss but it’s something that you have to try on your own. If you are interested in enjoying a little music, especially classical music, the Sumida Triphony Hall located in the Tobu Hotel is a very popular place. Almost every weekend has a major concert and the halls are available for rent, at a price of course. If that doesn’t interest you that much, they do have a shuttle bus that runs nearly daily and it can take you to Disneyland. I think that Kinshicho itself will be undergoing a small change in the near future due to its proximity to Tokyo Sky Tree. In order to cash in on the new attraction in the area, Kinshicho will have to do something. 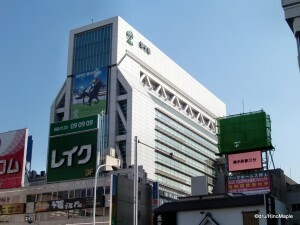 While it’s difficult to cash in on it as Kinshicho is a little far from the tower itself, they will need to change a little in order to create a destination spot for domestic travellers. I’m sure it could happen if the right people do the right things. Removing some of the old and dirty shops is a start. The small delicious shops will have to stay to retain the character of Kinshicho and some of the buildings will need a small renovation to make it more inviting to the casual shopper. Like most areas, they need to find a niche that will attract people. The north will continue to change with time as families and tourists start to take over. Shop owners will be forced to change and the community will want to do something about it. 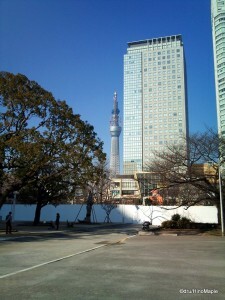 The south may not change much, if at all due to the character of the people and the lack of viewing locations of Tokyo Sky Tree. Tokyo Sky Tree will be the major catalyst for the entire region, but it will still depend on the people and businesses in the area. This entry was posted in Tokyo and tagged Akihabara, Arcakit, japan, Japan Racing Association, JRA, JRA Wins, Kabukicho, Kinshi Park, Kinshicho, Livin, Olinas, Ryogoku, Sumida, Sumida City Gymnasium, Sumida Gymnasium, Sumida-ku, tokyo, Tokyo Sky Tree, Tokyo-to, Wallmart, Wallmart Japan, Wins by Dru. Bookmark the permalink.